Detailplaneeringu avalikule arutelule oli tulnud nii palju inimesi, et linnaosavalitsuse saal oli puupüsti täis ning osa huvilistest pidi jääma koridori. Contemporary Art Museum Estonia (EKKM) and other active citizens are far from okay with a detailed plan change robbing the museum of its garden, outbuildings and options to expand. 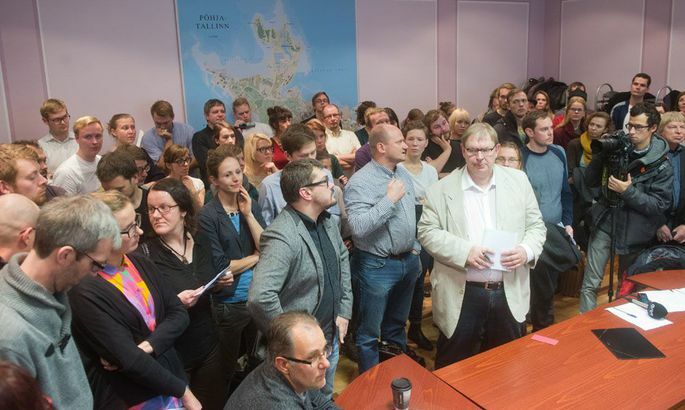 Yesterday, North Tallinn Government hall was packed to capacity with people attending public deliberation. Some had to stand. Some had to stand in the lobby. The hours of heated arguments mainly led to Tallinn chief architect Endrik Mänd conceding to further talks on spatial solutions. «Possibly, the review will lead to a change of planned solution,» he assumed. The main issue was why the lot next to EKKM was turned into commercial land, a «fundamental and substantial basic change» according to EKKM head Anders Härm. Also, Mr Härm reminded those present of the museum’s perspectives for development and the years of related discussions. According to architect Toomas Paaver as representing Telliskivi Selts Society, no private land is in question and thus here the city fathers bear full responsibility. «You represent the city. You hold all the cards, no private owner here to consider. /.../ The city is sole decision maker,» Mr Paaver reminded Mr Mänd. All the chief architect was able to do was shrug his shoulders and refer to the final decision made by politicians in city government, not the planners. «The plan lacks any vision other than we have 13,300 square metres of commercial land here, no explanations, nothing to substantiate it. Just a decision to have some kind of business set up,» said the critical Mr Paaver. As the talk drowned in details, an IRL politician Tiit Riisalo restated the main issue. «The people have gathered here to notify: townsfolk are not satisfied with the plan. And the reason they’re not is that the coast line – already teeming with construction, will add yet another monstrosity mainly meant for business,» said he. «The space might be for public use, for culture and art of every kind. And this is what the folks have come to say, not debate the details,» said Mr Riisalo, rewarded by quite an ovation. As those most active had had the chance to vent, the discussion wound up by promise of North Tallinn architect Kaidi Õis: everything will be recorded and forwarded to city planning department and via the department to members of city government. Prior to that, there ought to be a discussion of city planners and EKKM representatives, and then another one with Telliskivi Selts people. The reason for the change in detail plan was never once uttered during the meeting. A lonely explanation was offered by Foundation Culture Kettle head Väino Sarnet who noted the garden was in need of tidying up – while state and city no longer invest. With the crowd repeatedly suggesting that as Garden and EKKM are doing fine without any governmental funding and might as well continue in like manner, the officials present seemed not to sympathise. As explained by Mr Mänd, the outcome of discussions will be summarised and an official decision taken. Should any objection stand, the detail plan will be presented for Harju County Governor supervision who will take a thorough look and ask for additional information if needed. Thereafter, there ought to follow a discussion at the County Governor’s for those invited, seeking again for compromise. «In the end, the county governor will either approve the detailed plan or not. If yes, the city government has a green light to proceed. If not, city government may appeal to interior ministry. This the city government has never done before. When the detailed plan is finally approved, it may be contested in court asking for it to be declared null and void,» explained the chief architect.